I read my fair share of Harvey Comics in the 70s: Casper, Hot Stuff, Spooky, the various Littles (Dot, Audrey, Lotta, et al), Sad Sack and Richie Rich were as pivotal to my early reading as superhero comics were. 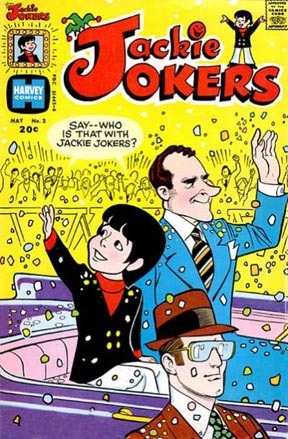 But maybe my favorite Harvey Comic was the bizarre, short-lived Jackie Jokers, a book about a vaudeville-style young comedian (no, it was not a period piece). Jackie was part of a successful showbiz family (including uncles and cousins), but somehow he lived in the typical Harvey suburbia instead of Los Angeles or New York City. But the weirdest thing about Jackie Jokers was that, despite being drawn as a little kid like Richie Rich, his exploits were decidedly adult, and many stories revolved around him trying to land grown-up roles in films. Also, his relationship with his girlfriend Candy seemed a bit less innocent than, say, Casper and Wendy’s. Anyway. Jackie Jokers only lasted 4 issues in 1973, but Jackie teamed with the richest kid in the world for a far more successful 48-issue run in Richie Rich and Jackie Jokers. But that book wasn’t nearly as off-kilter as Jackie’s solo comic (aided primarily by outstanding art by Ernie Colón at the peak of his abilities). I mean, come on…. How many other comic book characters shared a COVER with Richard Nixon?!??! Here's the cover to Jackie Jokers #2, May 1973, by Ernie Colón.